This word means many things to different people: for some it is a scary or dirty word, while others totally disregard it in any form, while others struggle with it but do sincerely try. Obedience isn’t to be feared if it is given, asked, taken, followed, submitted too under the guidelines of Scripture. Obedience is one of the foundational virtues that Jesus forms in those he calls. 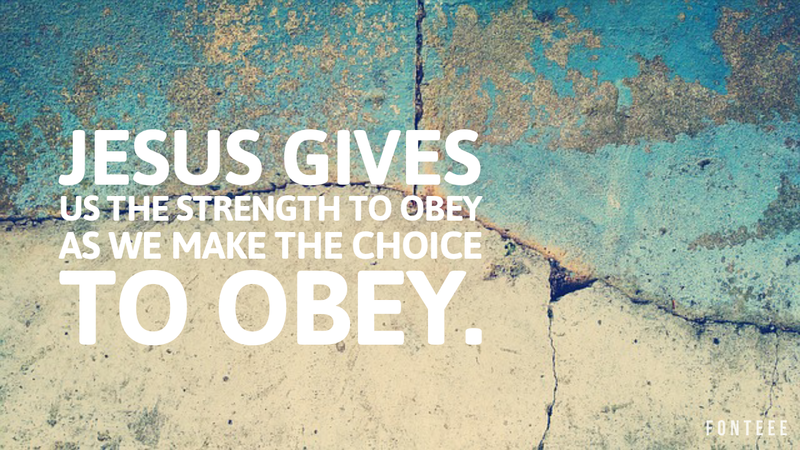 He gives us the strength to obey as we make the choice to obey. “But seek ye first the kingdom of God and His righteousness, and all these things shall be added into you” (Matt. 6:33). There are some who have choose to accept, believe, and trust wholeheartedly what biblical obedience is, what it looks like, and how it is to be asked and given. Not because they are super spiritual but because they have chosen before God that despite what their flesh tells them, despite what they were falsely taught (unknowingly and knowing), how they feel, or what has happened to them in the past, God’s way is the best way. God knows what He is talking about, God is God, therefore, I will obey Him and trust in His Words. Obedience to Him brings freedom. to keep a reader amused. Between your wit and your videos, I was almost moved to start my own blog (well, almost…HaHa!) Great job.